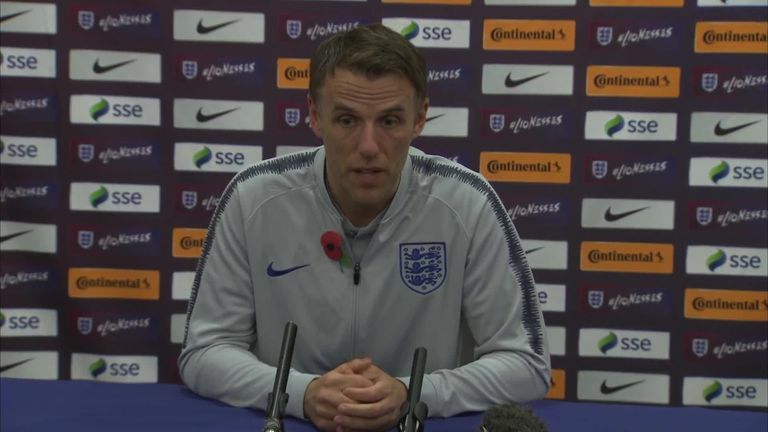 Phil Neville says the Football Association are working on a strategy to deal with social media abuse after Karen Carney received sickening threats online. Carney was targeted during Chelsea's 1-0 Women's Champions League win over Fiorentina, with Neville making the messages public as he called on Instagram take action against the person who posted the messages. Neville says the FA have spoken to social media companies, who have given training to the squad, and are working on a strategy to deal with future situations. Karen Carney and Mel Lawley have been called into the England Women's squad to face Austria and Sweden. "I took the decision without probably speaking to anyone that I needed to make public some of the stuff that my players have to put up with," Neville said ahead of Thursday's friendly against Austria. "Sometimes you have to do that to make people aware that it's not ok. I think coming out of that though, what we found is that all players suffer the same types of abuse and messages and we're now working to a strategy on how to handle that." He added: "As an FA we've spoken to the social media companies, we've had social media companies come in and give training to the players in the last camp, which we found really beneficial about what kind of things to put out there so you're not rubbing it in people's faces or teasing people or whatever." Neville does not believe social media can be policed at any level, and has suggested his players come off of it if the threat of abuse is too much to handle. "It's not going to go away, I don't think we're going to win that battle," he said. "I think the only battle is if you can't handle the risk of that kind of abuse, you've got to come off social media because I don't think as a country, as a world we can actually police social media." "It's not just footballers that suffer. Anyone in any walk of life suffers on social media, so there is a bigger picture in this. "That's why I put the message out and that's why Karen put her message out because ultimately it's wrong in any walk of life. "People say to me it's part and parcel of the job - that for me is totally wrong."